CASINO ROYALE is a stray cat. 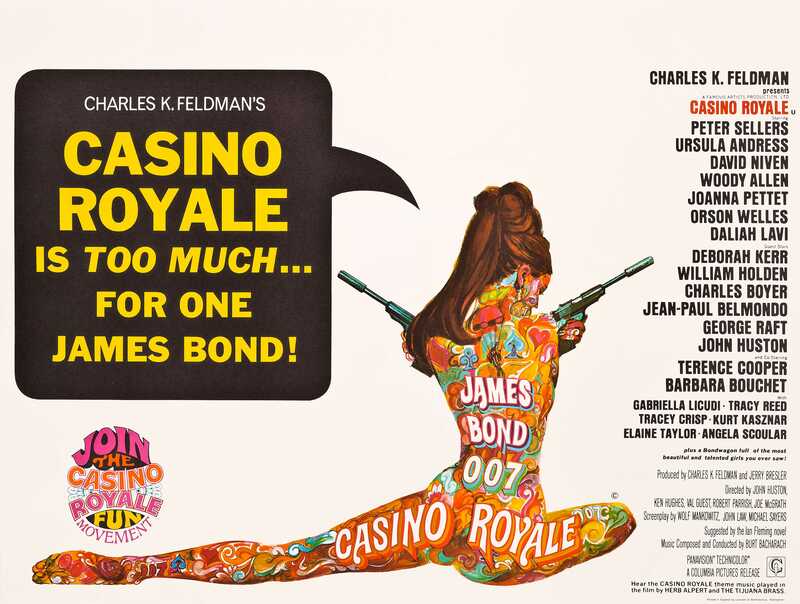 Giant spoof of the Bond craze has all the cool locales, fun gadgets, terrific explosions, lavishly appointed sets and scantily clad beauties that $12,000,000 could muster in 1967. It also boasts as much incoherence as five different directors could make of it all. Starts off brightly, with a bouncy number from The Tijuana Brass backing a marvelously inventive title sequence. Then, with editing recalling LSD, it goes in fits & starts until its long-delayed conclusion after 131 minutes. They didn’t stint on the cast. 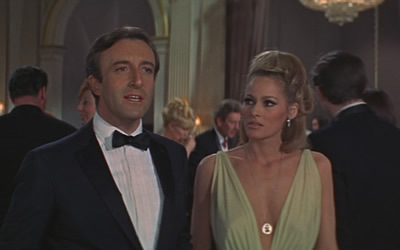 Leads and secondary roles are filled by David Niven, Peter Sellers, Ursula Andress, Deborah Kerr, Joanna Pettet, Orson Welles, Barbara Bouchet, Woody Allen, Daliah Lavi, Bernard Cribbins, Hermione Baddeley, Duncan MacRae, Graham Stark, Burt Kwouk and Percy Herbert. Guest stars packed in: William Holden, John Huston, Charles Boyer, George Raft, Jean-Paul Belmondo, Kurt Kasznar, David McCallum and Peter O’ Toole. 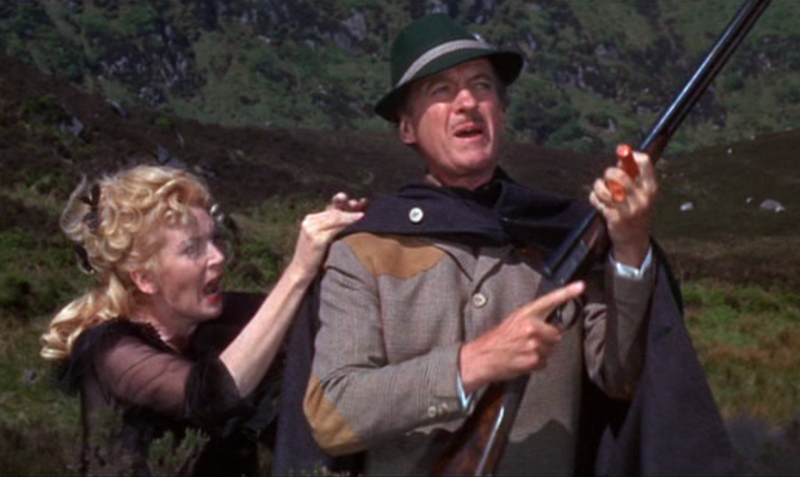 There are some good gags scattered around, with a number of smiles and laughs from Kerr, sporting the lustiest Scottish brogue this side of Robert The Bruce. Allen gets in a few chuckles. Sexiness abounds from Misses Andress, Bouchet, Lavi, Pettet and a newcomer named ‘Jacky’ Bisset. The plot doesn’t bear any inspection, nor the taste quotient; tedium runs neck & neck with the flashy aspects. A mixed bag, worth a peek for Bond fanciers and completists. “The Look Of Love” was nominated for an Oscar as Best Song. The five directors: John Huston, Kenneth Hughes, Val Guest, Robert Parrish and Joseph McGrath. Nicholas Roeg handled some of the photography with Jack Hildyard and John Wilcox. A list of those who had a hand in the assorted scripts that were concocted boggles—Ben Hecht, Billy Wilder, Terry Southern, Joseph Heller, and co-stars Sellers and Allen. Too many cooks. Reviews were dismal, fans groaned, yet it managed to bring in around $47,000,000. Official Bond #5, You Only Live Twice, showed up two months later.